In November 2011, Cebu was able to successfully host the largest Social Media gathering in Visayas thru Visayas Blogging Summit 2011. There were so many things that has been accomplished in the Summit such as topics Personal & Professional Blogging, Social Media for Business and Social Media Responsibility. 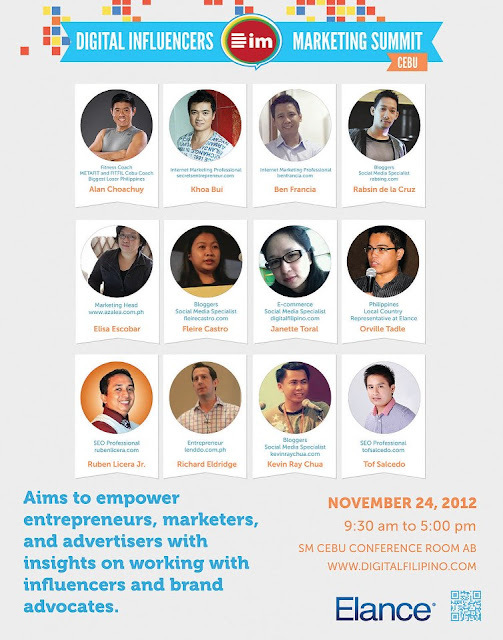 On November 24, 2012, DigitalFilipino.com is bringing the Digital Influencers Marketing (DIM) Summit 2012 in Cebu as part of its Advocacy to build and strengthen the digital influencers community in the Philippines. DIM Summit 2012 is considered to be the biggest Social Media Event in Cebu this year with the battery of Social Media topics plus the digital influencers from each topics will share the best practices and lessons learned as well as aspire people to become influencers in their field too. The Digital Influencers Marketing Summit in Cebu is set to take place at SM Cebu Conference Room AB. Above DIM Summit Cebu 2012 poster bears the Social Media Topics and the Digital Influencers who will help attendees to learn more from each topic. As a blogger and as a brand advocate too, I see the need to listen to most of the topics in the upcoming Summit for me to know the latest appropriate practices and to gauge myself where I am now versus the recent developments especially that Social Media is getting more relevant in the community. To give you more of the idea aboou the Summit, watch the following video. This is Miong of Matudnila.com, See you at the Summit! 6 comments: on "Digital Influencers Marketing Summit 2012 in Cebu"
Our experience sa Visayas Blogging Summit was good, hoping that we can insert Digital Influncers Summit in our schedule. Ty. Hi Guys I hope your expectations were meet during the Summit! Nice meeting you guys earlier. Thanks @88dB, @Ayik dont worry, just visit DigitalFilipino.com for updates of new DIM maybe in a new City that you could condider joining.